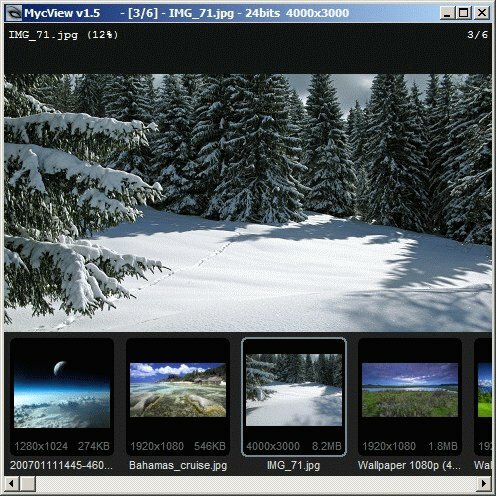 MycView automatically displays a slide show of all the pictures of a given directory in full screen mode. Reads a variety of file formats including JPG, PNG, GIF, TIFF, BMP, DIB, RLE, PNM, EMF, WMF, ICO, CUR file formats, as well as list LST files, SLD (XnView). - Automatic closing at the end of the slideshow with the parameter "/c"
- Display in a window or full screen with the key "f"
- Opening a new file with the keystrokes "Ctrl-O"
- Number of loops defined with the parameter "/l"
- Open the context menu with the Middle-click or "Ctrl-M"
- Change the background color with the option "/b"
How to extract: Download the ZIP package and extract to a folder of your choice. Launch mycview.exe. Added: The parameter "SearchPath=0" (INI file) disables the research in folders if the program does not find images at startup. DE = "\Dokumente und Einstellungen\All Users\Eigene Dateien\Eigene Bilder\"
IT = "\Documents and Settings\All Users\Documenti\Immagini\Immagini campione\"
SV = "\Användare\All Users\Dokument\Mina bilder\Exempelbilder\"
Changed: If the program can not find any image, it opens the window for selecting a new file. Changed: Optimization of dynamic resizing of the window. Fix: Wrong width of the thumbnails, when the original folder is empty. Fix: If the INI file does not exist, the window opens with coordinates to zero. Fix: Incorrect offset in the dynamic construction of the menu. Been experimenting with this app again; was looking for a simple slideshow viewer that responded well to voice commands, for use with a Windows 8.1 tablet. Very good for that; still would like to see a random order option. Almost perfect! All it lacks is the ability to run a slideshow in random order. Excellent viewer! (Reminds me of gThumb on Linux.) The right-click menu is so handy, but it's missing one item. (I had to go to their website to find it.) The thumbnail pane is "mouse-over / autohide". Press "t" to get the thumbnail pane to stay in place. Minimal and decent looking image viewer with easy to remember hotkeys.